While there are many cases illustrating how an engaged patient is a great asset to the healthcare ecosystem, one of the most compelling is that of Eric Dishman’s. In his TED talk, Eric shares his personal experience with the inefficient healthcare system. Through his own example he demonstrates how mobile technological tools can help fill in the gaps of the current flawed system. More importantly, he champions the role of a more engaged patient as a way to improve healthcare outcomes. Healthcare has long been a paternalistic, hierarchical, doctor-knows-it-all industry. With the advent of the internet, social networks and smartphones this is no longer so. Patients today are much more informed, connected and ready to take an active role in their fitness and well-being. Moreover, in the wake of Affordable Care Act, patients are paying higher deductibles and out-of-pocket payments that further require them to take stock of their own health and wellness. As healthcare transitions from pay-for-service to pay-for-outcomes, providers have to ensure their services are effective and efficient, which necessitates a highly engaged patient. For payers as well patient engagement is pivotal to achieve shared savings under new delivery structures such as the Affordable Care Organizations (ACO) and Patient Centred Medical Homes (PCMH). Given that poor adherence costs US healthcare nearly $290 billion a year, patient engagement has been rightly deemed as the ‘blockbuster drug of the century’. Mobile Health (mHealth) has enormous potential (as highlighted in Eric’s example above) to revolutionize healthcare through patient engagement. 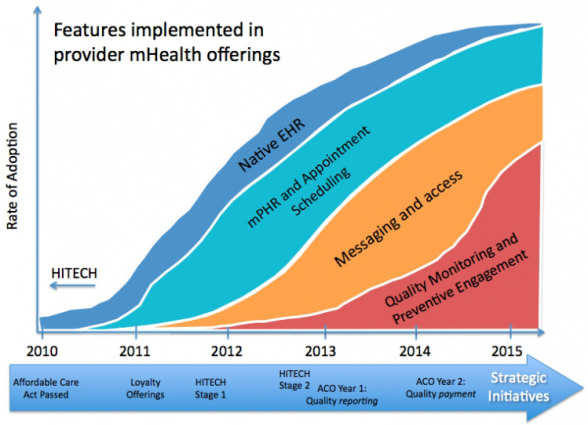 And as the focus of the healthcare system moves to Meaningful Use Stage 3, the strategic importance of mHealth is all the more pronounced. The use and popularity of above applications attests that mobile technology enables patients to be more informed, collaborative and committed. But integration of IT systems, complex healthcare environment, quantifying the benefits, measuring the ROI, patient stickiness and privacy concerns pose serious barriers to adoption. Given an opportunity to save $290 billion and a case as compelling as Eric’s, can we afford to ignore it?